Cooking with flowers is becoming ever more popular. Salads are dotted with orange bursts of nasturtiums and pansies, ice creams are laced with lavender, and the most recent Great British Bake Off episode showed Ruby scattering her savoury bread in a confetti of rose petals. “Flowers are essentially tarts.” said Uncle Monty, in Withnail & I, “Prostitutes for the bees.” The bright, elegant petals prettify a dish so easily. No wonder they are appearing in more and more recipes. But while a flower instantly draws attention, a leaf is so easily overlooked. There are, of course, a group of common, edible leaves: lettuce, cabbage, spinach, kale, broccoli, endive, raddicio and, pak choi – just to mention a few. There’s also a group of leaves used primarily to infuse flavours into a dish, such as bay leaves, curry leaves and kaffir lime leaves. But considering the number of leaves colouring Britain’s landscape, their limited culinary use shows little imagination. Looking further afield, leaves are put to far better use in the kitchen, often used as a cunning alternative to grease proof paper, when cooking en papillote. In Mexico, marinated pork is wrapped in avocado leaves before grilling, and Middle Eastern dolmas put vine leaves to good use. In southern India, fish is often mixed with spices, and wrapped in a banana leaf before cooking. And dim sum parcels are frequently steamed in lotus leaves, infusing sticky rice with vegetal, tea-like flavours. Of course, not all leaves can be cooked with. Although the strong, green canopy of a rhubarb leaf invites you to wrap and cook food in it, they are in fact poisonous. Tomato leaves also have a strong aroma – exciting for a cook – but similarly unadvisable to use in the kitchen. Leaves sprayed with weed killer are – quite obviously – not a good idea. And potato leaves are so toxic, they have been listed as the official cause of death for several people who steeped them in hot water to make a potato leaf tea. Don’t let this put you off though. Simply make sure you do sufficient research before experimenting with a new leaf in the kitchen. 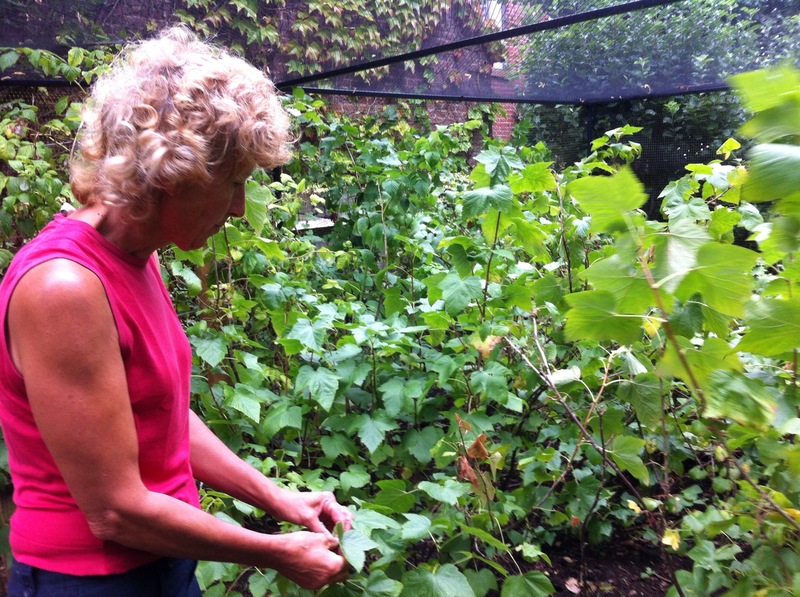 Blackcurrant leaves are an excellent place to start for inspiration. Standing in a blackcurrant fruit cage in a fog of heady berry-scent, you can quite easily assume that it comes from the berries themselves. 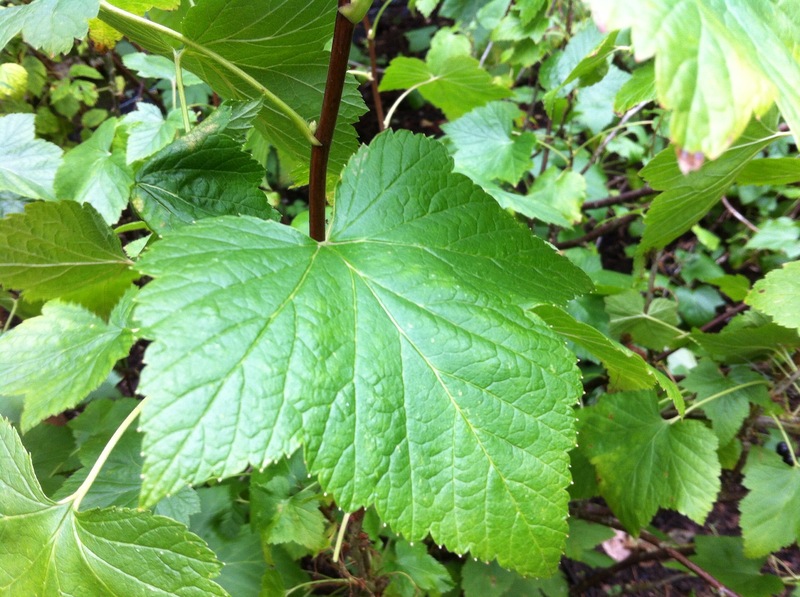 Crumple a leaf in your hand though, and smell the delicious jammy-blackcurrant notes. 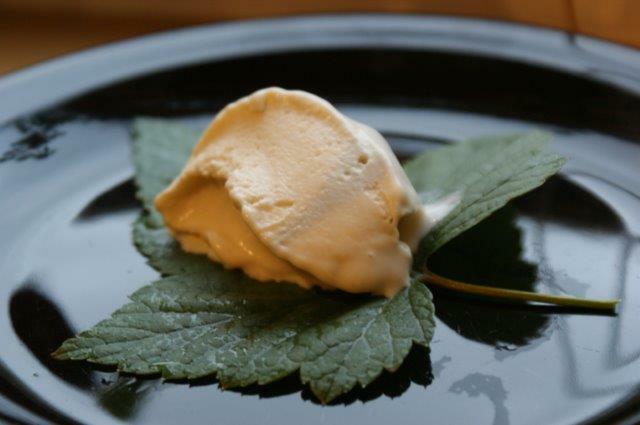 When steeped in any warm liquid, they obligingly release their flavour, making the leaves an unexpected – but wonderful – flavouring agent for cordials, sorbets and jellies, as well as this delicious blackcurrant leaf ice cream recipe below. This makes enough for a little, experimental portion, which we churned during supper and ate straight out of the ice cream machine (see above). 1. 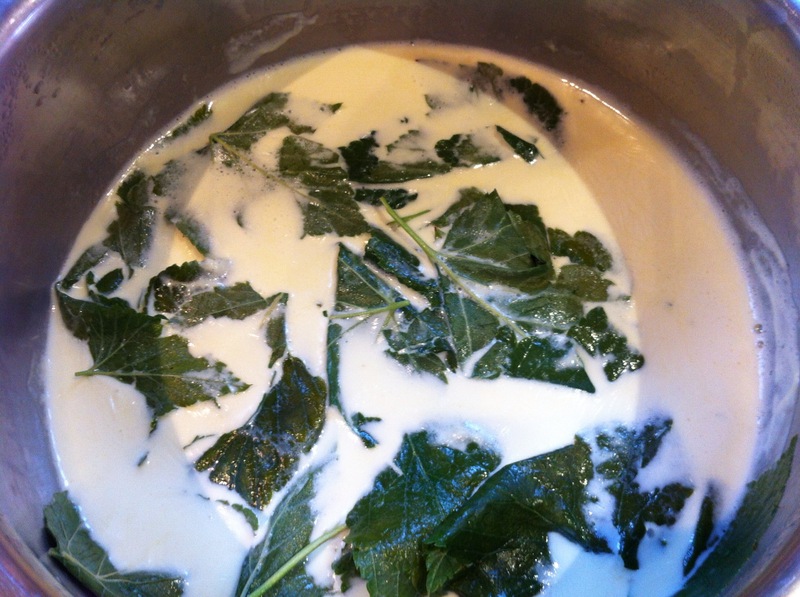 Pour the milk and cream into a saucepan, add the leaves and heat gently. 2. In the meantime put the egg yolks and sugar in a pan, and whisk together into a pale-yellow, thick mixture. 3. Remove the milk and cream mixture from the heat just before it boils, and strain the fragrant liquid a jug. 4. Slowly, pour the hot milk and cream over the egg and sugar mixture, whisking constantly, and then return to the heat, stirring slowly until it becomes a thick custard. 5. Let it cool, and then churn in an ice cream maker. 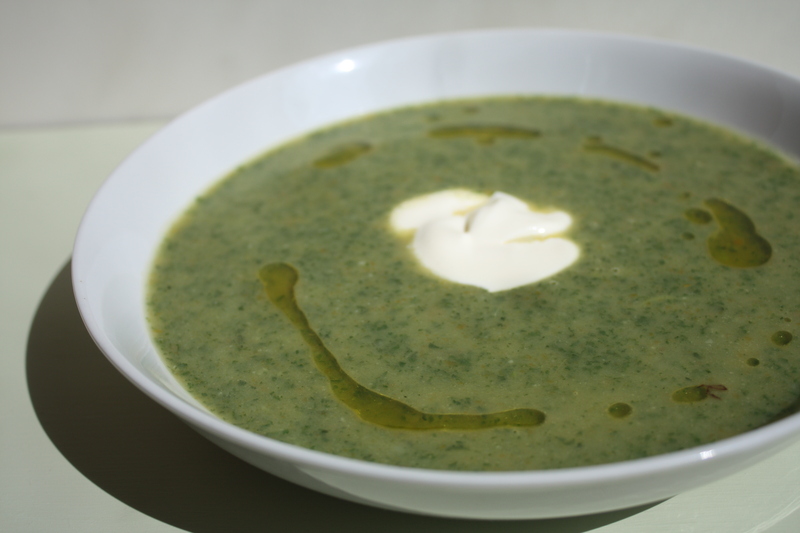 Seeing as I was having such fun experimenting with leaves, I also decided to have a go at nettle soup – something I’d read about, but never tried. My mum had kindly (!) grown some nettles in her veg patch, so I put on some rubber gloves, got picking, and brought a big bagful of the leaves back to London. 1. Melt the butter in a heavy-bottomed casserole dish. Soften the onions, carrots and celery on a medium heat. Add the garlic, and stir until it’s cooked. 3. In the meantime, prepare the leaves. 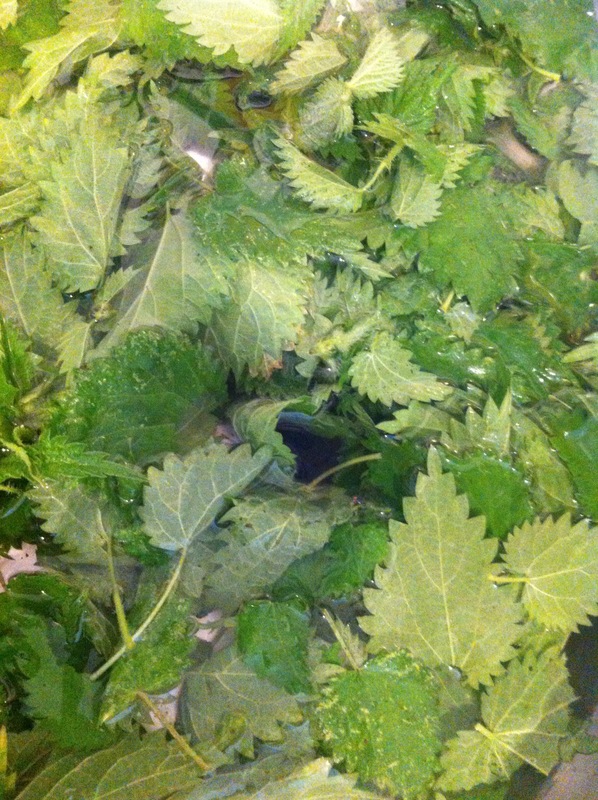 Put on some thick washing up gloves, and pick the nettle leaves off the stalk, washing them thoroughly. 4. After 20 minutes or so, (once the potatoes are cooked) add the nettle leaves to the pan just for one minute. 4. Remove the pan from the heat. Whizz in a blender, and use salt and pepper to season. 5. Serve with a generous dollop of creme fraiche and a drizzle of olive oil. Never thought of eating blackcurrant leaves before! Lovely post. I will give this a go! The blackcurrant leaf ice cream is DELICIOUS. Truely inspiring. What a great post! Blackcurrant icecream sounds so experimental but love how the recipe is simple. Must try, spesh as I have a new icecream machine!